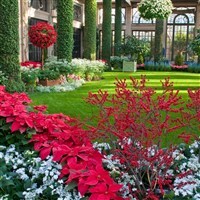 Longwood Gardens consists of over 1,077-plus acres of gardens, woodlands, and meadows. It is one of the premier botanical gardens in the United States boasting 20 outdoor gardens and 20 indoor gardens within 4.5 acres of heated greenhouses, known as conservatories. It contains 11,000 different types of plants and trees, as well as fountains. Come with us to celebrate spring with a walk in the garden. When the first yellow buds of witch hazel appear, we know life is returning to the Gardens. With flowering trees, daffodils, and more than 240,000 tulips bursting into bloom, Spring Blooms creates a symphony of color like no other season. Wander through our acres of spring... and come to life. In April, the Idea Garden and Flower Garden Walk burst into bloom with spring bulbs and tulips in a rainbow of color, and spring annuals such as pot marigolds and snapdragons. Peirce's Woods will abound with native azaleas, columbines, Virginia bluebells, and foam-flowers. Lunch is on your own at The Cafe at Longwood Gardens. On your own at "The Cafe"